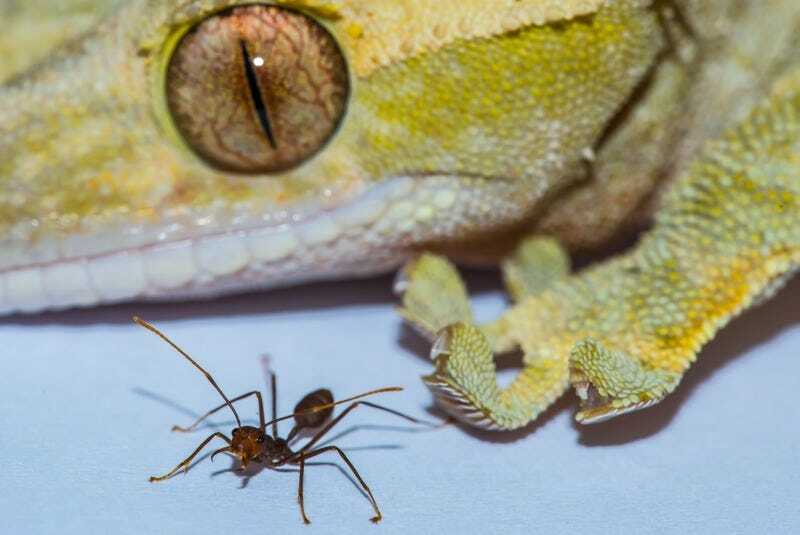 Spider-Man ain’t got nothing on the Gecko, it turns out. Geckos are well-known for their ability to adhere to almost any kind of surface, making them fantastic climbers. In fact, they’re the largest creatures able to maneuver along vertical walls, and a new study concludes that this is because of scaling limitations as animal body size increases. University of Cambridge zoologist David Labonte and several colleagues measured the size of those footpads relative to body surface area in 225 animals, ranging from mites to geckos. And they found that adhesive pads in mites, for instance, require 200 times less body surface area than those for geckos. Following that scaling law, Spiderman would need to cover 40 percent of his body—fully 80 percent of his front—in adhesive pads if he wanted to scale a vertical building. That’s because body surface area per volume decreases as an animal grows in size, according to Labonte. “An ant has a lot of surface area and very little volume, and an elephant is mostly volume with not much surface area,” he explained. Bigger and heavier animals need a lot more stickiness to climb a vertical surface, but there’s just not enough body surface area for the necessary large footpads that wold be required. The way the scaling works out, a gecko is pretty much the biggest size possible, given those constraints.